In this weeks episode I will be discussing The Shadow #0 published by Dynamite Entertainment. This issue came into comic shops this week and features The Shadow training with Harry Houdini. The issue is written by Cullen Bunn and illustrated by Colton Worley. Marc Rueda provided the colors and Rob Steen was the letterer. The issue takes place in two separate time periods. One portion is set in New York City in 1925 with Lamont Cranston being trained in the art of escape by Harry Houdini. Another portion takes place in Los Angeles in 1936 with The Shadow venturing into the lair of the Society of United Magicians to save Houdini’s kidnapped widow, Bess. Combining The Shadow and Houdini is a great idea. Walter Gibson, the creator of the pulp Shadow was a magician himself and ghost wrote for Houdini. Houdini himself was also a credited pulp writer. He is credited for writing the story Under the Pyramids for the 50th Anniversary issue of Weird Tales. In reality this was ghost written by H.P. Lovecraft based on an idea by Houdini. In this weeks episode I will be discussing a short story by Philip Jose Farmer that I have recently finished reading. The story is called Savage Shadow and as you can guess from the title it fits into the body of work known as his pulp period. It was originally published in 1977 in the pages of Weird Heroes #8, a new pulp series of books put together by Byron Preiss Visual Productions and published by Pyramid/Jove/HBJ. It was later reprinted in Pearls From Peoria in 2006, a hardcover collection of Farmer’s writing edited by Paul Spiteri and published by Subterranean Press. In addition to the Savage Shadow, an article written by Farmer titled The Grant-Robeson Papers is included in both books and serves as a Foreword to Savage Shadow. 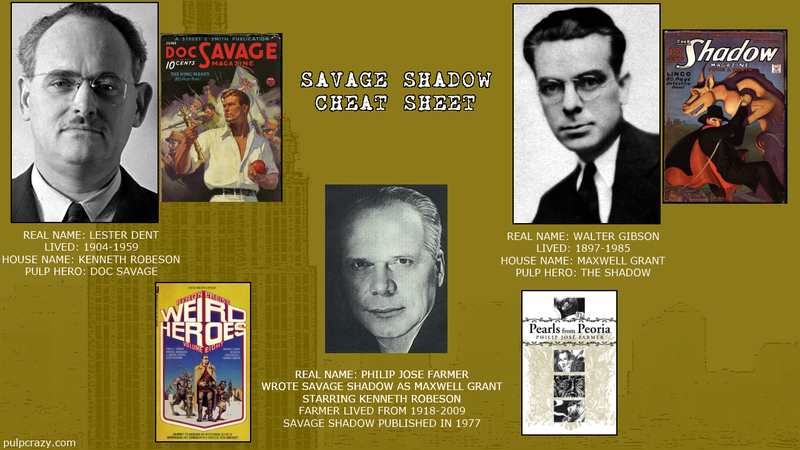 Savage Shadow was to be the first in a series of stories that Farmer dubbed The Grant-Robeson Papers. To boil it down to the most basic premise, in Savage Shadow Farmer writes under the name Maxwell Grant (the Street & Smith house name Walter Gibson and others wrote under when writing the Shadow pulps). The star of Savage Shadow is an aspiring young pulp writer named Kenneth Robeson, which is the Street & Smith house name Lester Dent and other wrote under when writing the Doc Savage pulps. Be sure to watch the videocast or look at the Show Notes for a little visual aide Cheat Sheet that I made for clarification. In this weeks episode I will be discussing two short stories written by Pulp authors that are about Batman. 2014 marks the 75th Anniversary of the Dark Knight Detective. His first appearance was in Detective Comics #27, which first hit the stands on March 30, 1939. Making this past Sunday his 75th birthday. It’s no secret pulp heroes played a major influence in the creation of Batman, but what some people might not know is that two pulp authors have actually written Batman stories. There may be more than these two, but I’m not aware of them. The two pulpsters I am speaking of are Walter Gibson and Isaac Asimov. Walter Gibson’s “The Batman Encounters Gray Face” was published in Detective Comics #500 in March of 1981. I read Isaac Asimov’s “Northwestward” in The Further Adventures of Batman collection edited by Martin H. Greenberg published by Bantam Books in 1989.